2019 Word of the Year - plus upcoming classes and exhibits! Do you choose a word of the year? I did for the first time in 2018 - Flow. I loved the opportunity to set goals for the year ahead and use this word throughout the year in my art. Coming up for 2019 I have a few things scheduled already - exhibits, workshops, and more! 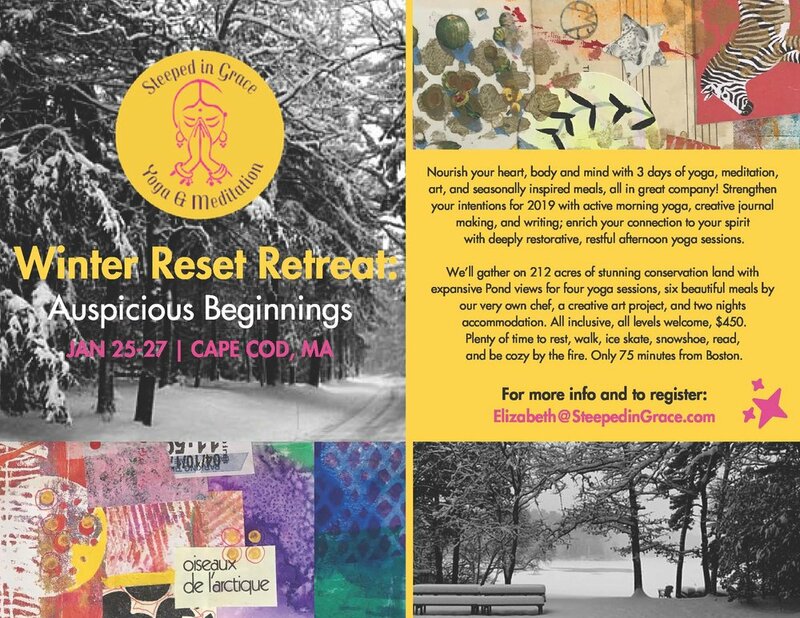 Join me and yogi Elizabeth Brown for a weekend yoga retreat to prepare for the new year. As a part of this retreat, I am teaching a bookbinding class for us to make a journal to prepare for and reflect in throughout 2019. We will use special papers that I have collected (and you can bring meaningful papers from home) to build this special book. I’ll provide the lesson and some time for reflection after one of Elizabeth’s amazing classes. Four yoga classes, chef on site for all meals provided, amazing connections to be made. Want to come? Email me or Elizabeth@steepedingrace.com directly… it will really be an awesome way to kick off the year! Plus, I have scheduled four classes in Newburyport at Newburyport Art Association. You can find more about those on my workshop page. Registration is open and I’ve heard people are signing up already, so now is the time to plan this into your schedule! Link to sign up here. I will be scheduling other classes this year soon. Join my mailing list to be informed of new class announcements as they come up throughout the year! Printmaking Group Show 2019 at Newburyport Art Association, Newburyport, MA June 25 - July 7, 2019. Three Women, Small Group Show (with my mom and sister!) at Tannery Pond Gallery, North Creek, NY July 27 - August 29, 2019. What are your plans for this coming year? I’d love to hear your word of the year! Send me a note!